Part of The Away Network, Great Outdoor Recreation Pages is a robust online resource focused on local hiking, camping, and national parks and other public lands; profiling hiking trails, gear, and weekend city escapes. Founded over ten years ago, The Away Network specializes in all elements of travel, from helping customers find their next dream destination to the nuts-and-bolts of what to pack to weekend resources for quick escapes. Away.com specializes in niche travel for such demographics as family, active, GLBT, or romantic travel. GORP is also affiliated with the online edition of Outside Magazine, based out of Santa Fe, NM. 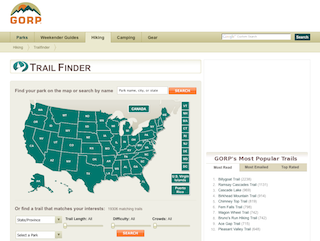 One of the products on GORP.com is the Trail Finder - a robust, searchable database of hiking and biking trails throughout the U.S. and Canada. During a platform migration, however, the tool stopped working the way it was envisioned. During that time, GORP also acquired additional content via syndication with Wildernet as well as commissioned material on Away.com. All the data from various sources needed to be combined into one central resource. More importantly, given that much of the data was written as much as ten years ago, it became increasingly important that the GORP community start participating in the regulation of the trail tool, rather than taking on the onerous task of managing the entire product in-house. A wiki approach was identified as the best approach. After an internal evaluation of Wiki providers, GORP arrived at EditMe as easily the most flexible solution given the budget. "EditMe is capable of building a custom tool to serve the full functionality of the vision without putting an excessive burden on our tech team," stated Nathan Borchelt. "The fact that they had built similar products, could work in Ajax and other web-savvy tools/languages, could turn it around quickly, and would work with us directly were huge factors that weighed in our decision." Getting this custom web application launched required a partner who could think strategically and act tactically. The project encountered some unexpected UI and data issues, and together GORP and EditMe defined a strategy that met the commitments without overtaxing the team's resources. Nathan also credit's EditMe's fast, friendly service in fixing any post-launch issues as "essential for the product's long-term survival." Finally, EditMe's advanced capabilities re-assured the GORP team that EditMe was the right partner for future iterations of the site, where the wiki tools will be brought onto GORP's platform. "They worked with us as partners interested in executing the best product, not just putting a rubber stamp on the project." Lots of unorganized data becoming out of date. How to tap the community of enthusiasts to maintain all the information? Create a robust, user friendly community on-time and on-budget. EditMe’s flexible platform makes it easy for non-technical contributors to use. EditMe is a strategic partner that can get things done. EditMe built a user experience that allows a user to access data on the front end via different types of custom search parameters.